Poland is the only country in the European Union where the decrees issued by Joseph Stalin in 1944 and the following years are still in force. No reprivatisation law has been passed. A fundamental factor of Polish identity is still being destroyed. We present here some examples of manor houses and palaces that were destroyed after the Second World War. In 1939, there were almost 20,000 manor houses and palaces in Poland, including 4,000 buildings located in Eastern Borderlands that were cut off by a new border. 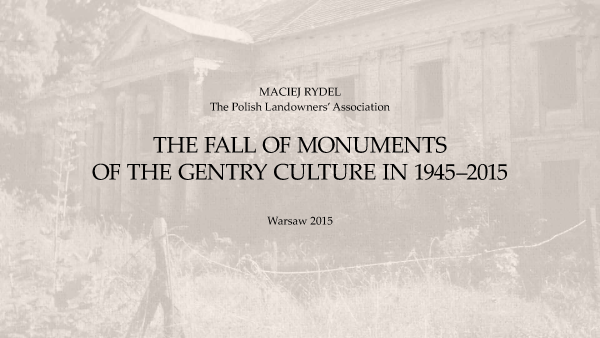 In the register of monuments created by the National Heritage Board (Narodowy Instytut Dziedzictwa, NID) in 2014, there were 4,823 buildings; 1,823 buildings were located in the Western, “Recovered Territories.” The legacy of the Polish landed gentry: manor houses, palaces—3,000 buildings. Referring to the original state, 150 rural manor houses and palaces that still exist in Poland have preserved the architectural and historical character. It is less than 1% of the total as for 1939. In Poland, there is not a single complete manor and garden layout, with green infrastructure, that has survived the period of the Polish People’s Republic. A centre for research and documentation of the gentry, their residences and practices does not exist. The greatness of nation can be judged by how it cares for monuments of the past, rooted in the native soil and unique for a given place and its community. Manor houses and the gentry culture are one of the most characteristic features of the Polish identity. To destroy them means to cut off our roots. In Poland, there is not a single centre (museum of the gentry) that would collect archival materials related to the history of the gentry, their residences and practices. There are no specialised institutions that would run libraries, conduct researches into the history of the gentry, offer educational programmes.